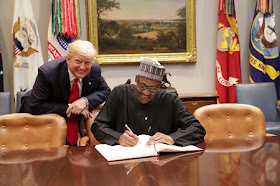 President Muhammadu Buhari has said that President Donald Trump of the United States of America was given wrong information on recent killings in Nigeria, describing those behind the report as ‘mischief-makers’. President Buhari said the information that Christians were being killed in Nigeria by herdsmen was untrue. Asked what other agreements Nigeria and US had apart from the jet fighters, President Buhari said, “Not agreements, just discussions. The first one is the information being given to them that Christians are being killed in Nigeria; but what happened in the Church also happened in the South East and the North and they just say it is herdsmen that are killing them. “Those making these allegations against the herdsmen know that herdsmen as we know them only carry sticks, going about with guns is a new thing and those making the allegations knows that conflict between farmers and herders has a long history even before we were born. Recall that two priests and 17 worshipers were last week killed in Benue state at a church by suspected herdsmen. There has been several other attacks.